This blog post was contributed by John Graham, vice president and regional director of compliance research at Sibson Consulting. Since the new tax bill was passed, we’ve received a number of questions as to how the legislation affects higher education and its employees. To help answer these questions, we’ve partnered with CUPA-HR Mary Ann Wersch Premier Partner Sibson Consulting to publish a series of blog posts. These posts will be based on the information we currently have and will be updated as any guidance is issued. The content is for general information purposes only and should not be considered tax or legal advice. This first post by John Graham will answer some of the questions surrounding the unrelated business income (UBI) tax that applies to tax-exempt colleges and universities as well as relevant changes to the fringe benefit rules. Under the new (as well as the prior) tax law provisions, income from what is classified as an “unrelated trade or business” and debt-financed income can give rise to unrelated business income (UBI). To parallel the changes in the corporate tax rate, for tax years beginning after December 31, 2017, unrelated business taxable income, which is UBI after deductions and a $1,000 “specific deduction,” is generally taxed at a flat tax of 21 percent (a special rule applies if the institution’s tax year is not the calendar year). 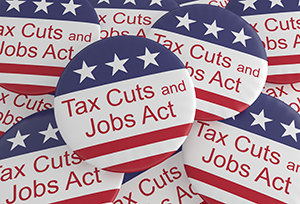 UBI tax is reported by the institution on Form 990-T, which will be updated for 2018 to reflect the changes brought by tax reform. In addition to the items that have traditionally been subject to UBI tax, the tax reform legislation adds a number of other items. The rationale behind these additions is that since tax reform removed the deduction for these items for taxable corporations, which are subject to a 21 percent tax rate, a 21 percent UBI tax will generally treat tax-exempt entities the same as taxable entities. Under tax reform, beginning with the 2018 taxable year, UBI of a tax-exempt institution will include the value of any qualified transportation fringe benefit provided on a pre-tax basis to employees. This likely includes buses, van pools, transit passes, parking passes and reimbursements. The language of the law is broad enough to include reimbursement for parking and transit benefits that are paid from pre-tax employee deferrals. Example: A college provides parking vouchers to 60 employees that pay for $50 per month of parking expenses on a tax-free basis. The annual value of those vouchers would be $36,000 (60 X $50 X 12), which would be treated as unrelated business income. The $1,000 specific deduction would be subtracted from the UBI. The $35,000 balance would then be subject to the UBI tax rate of 21 percent, resulting in a $7,350 tax bill for the college. As a result of the change, if an institution wants to continue to provide these benefits on a pre-tax or tax-free basis, the institution is required to report the value of the benefits as unrelated business income. On the other hand, if the organization chooses to no longer provide tax-free or pre-tax benefits, the benefits will be treated as increased income subject to higher FICA taxes (and employees will also face higher income taxes), but there will be no UBI tax. Under the new law, the value of use of on-premises athletic facilities provided to employees would be considered UBI to the institution. However, it very often will not apply. For purposes of the tax, an on-premises athletic facility is defined under the Internal Revenue Code as one: (1) which is located on the premises of the employer; (2) which is operated by the employer; and (3) substantially all of the use of which is by employees, their spouses and their dependent children. In most cases, on-premises athletic facilities are provided for and used primarily by students. As a result, the value of use of an on-campus fitness center can still be provided tax-free to staff, and will be free of UBIT for the institution. Under tax reform, employees may no longer exclude from income reimbursements received from their employer for their moving expenses. (For example, a university must include in income any amount it reimburses a new professor for moving to the university’s location.) Similarly, employees may no longer deduct any unreimbursed qualified moving expenses. These changes are effective in 2018 and will continue through 2025, when they sunset. Prior to tax reform, an employer could reimburse qualified bicycle commuting expenses, on a tax-free basis, of up to $20 per month for each month that an employee regularly uses a bicycle for commuting to work. Tax reform has eliminated this exclusion from income. This change is effective in 2018 and will continue through 2025, when it sunsets. Tax reform changes the employer deductibility of most employee achievement awards and the exclusion from income for the employee. The change affects cash, gift coupons, gift certificates, vacations, meals, lodging, tickets to sporting or theater events, securities and “other similar items.” The change does not impact gift certificates allowing the recipient to select tangible property from a limited array of items pre-selected or pre-approved by the employer. For these purposes, an employee achievement award is tangible personal property awarded: (1) for a length of service achievement or safety achievement, (2) as part of a meaningful presentation, and (3) under circumstances that don’t create a likelihood of disguised compensation. Let us know what challenges you’re facing due to these tax changes, or share examples as to how you’ve addressed these changes. Email learn@cupahr.org.